Utilizing L-ACOUSTICS' award-winning coaxial technology and packaged in a high performance, self-powered format, the new P SERIES line represents L-ACOUSTICS' answer to the increased demand from sound professionals for an all-round, 'plug and play', compact solution for no-compromise sound reinforcement and monitoring applications. The 112P combines the latest L-ACOUSTICS technologies and offers demanding sound professionals the ultimate performance in a multi-purpose portable PA system. Designed to respond instantly to any production situation, the self-powered coaxial 112P presents an exclusive combination of features making it an extremely flexible and powerful audio tool. The 112P features a 1.4 inch compression driver coaxially-loaded with a twelve-inch low frequency transducer. This coaxial combination produces coherent point source radiation with axi-symmetric directivity allowing the enclosure to perform equally in any orientation over the entire 90 beamwidth of the speaker. State-of-the-art components powered by a high-efficiency 1000 W class D topology amplifier designed for optimized headroom yields an outstanding sonic fidelity and dynamic performance with a full exploitable SPL under all circumstances. The 108P was primarily designed as a live reference monitor with an audio signature similar to that of the acclaimed DOSC line source arrays. Providing the same accurate response, consistency, and stereo imaging of an L-ACOUSTICS line source array in near-field applications, the 108P will naturally become the speaker of choice of live mix Engineers who are used to experiencing the unique and exclusive acoustic signature originating from the modern line source inventor. V-DOSC users will instantly fall in love with the 108P! An intelligent fast rigging system allows the 112P to be mounted on ceilings, walls, scaffold or truss. 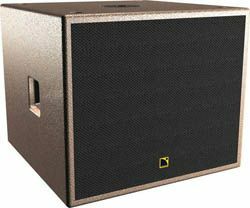 The SB15P was designed as a companion reference subwoofer for the 108P and 112P self-powered coaxial loudspeakers. Featuring a front-loaded 15" transducer in an optimized sized/tuned vented enclosure, the SB15P combines the convenience of self-powered performance with the flexibility of digital signal processing. Ideal for portable sound reinforcement, the SB15P provides plug-and-play operation and is equipped with a 1000 W class D topology amplifier module and dedicated on-board DSP with instant recall, application-engineered presets. The 15" component employed in the SB15P features elevated power handling and excursion capability along with reduced distortion and thermal power compression. Advanced component performance is complemented by integral power amplification and protection to provide exceptional SPL output and secure operation. Optimized tuning provides an ideal combination of temporal accuracy, bass articulation, musicality and low end definition that only a front-loaded subwoofer can provide.